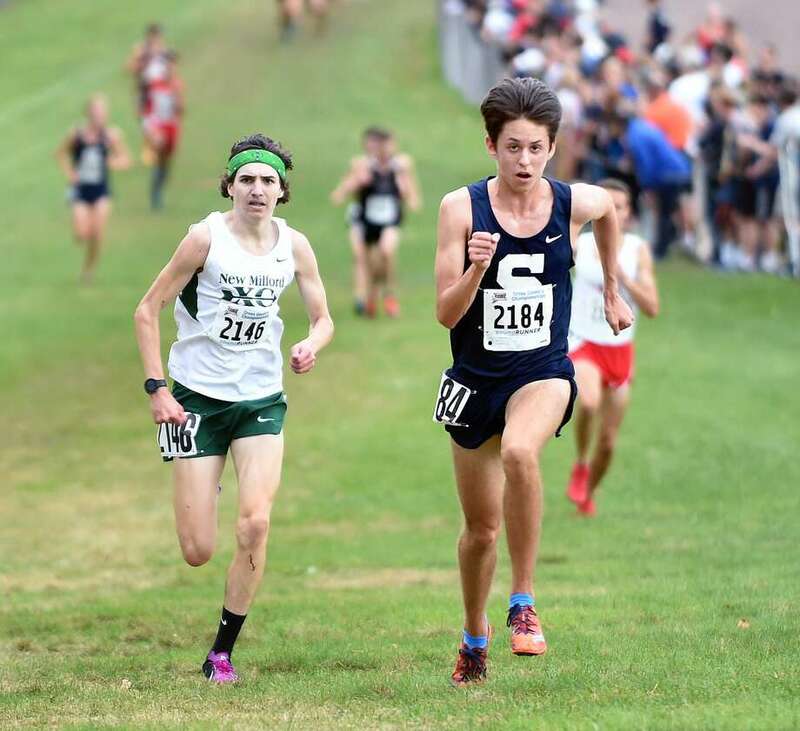 Benjamin Seiple, right, of Staples, and Eli Nahom, left, of New Milford, placed fourth and fifth respectively in the CIAC Fall Championship Boys Cross Country race in Manchester in 2017. The New Milford boys cross country team returns a solid core of runners this year and looks to once again compete for league and state titles. And the girls team hopes to turn their hard work into wins as well. A perennial contender in the South West Conference, New Milford boys had a streak of three straight Class L state championships snapped last season when it finished runner-up in Class L.
The potential is there for the Green Wave to return to their winning ways, but things will have to go their way as well. In his 21st season as Green Wave coach, Bacich has a team that will be led by key returners Eli Nahom, Mike Rafferty, Garred Farrell, R.J. Harkin, and Jason Golembeski. According to Bacich, freshman James Najera has been doing an excellent job in early-season practices and could make an impact. One of the team’s preseason top five hopefuls was sophomore Sam Quigley, whose family has moved. He is now at Shepaug, where Bacich thinks he’ll do very well and be a major contributor. The boys have their first home meet on Monday when they host Bethel and Brookfield. The Green Wave will then run on Sept. 22 in the Amherst Cross Country Invitational in Massachusetts. On the girls side coach Giles Vaughan is back for his sixth season in charge of the team. Key returners for New Milford are senior captains Brooke Morabito and Katie Delaney, junior Julia Colley and sophomore Shannon Palmer. Freshman Claire Daniels is expected to contribute this season as well. “Our goal is to improve as runners each day by doing all the little things, working hard, maintaining a positive attitude, and having a relentless passion for our sport,” Vaughan said. The girls host Bethel and Brookfield on Monday before competing in the Winding Trails XC Invitational on Sept. 22 at Winding Trails in Farmington. “We have great leadership in our two captains and they have worked hard all summer, hopefully we can turn all that hard work and training into competing at a high level as our dual meet season starts and improve and learn from each race that we run,” Vaughan said.